This home was opened in 1901 by Leeds Union. As an alternative form of provision to the Cottage Homes which were being developed by many Poor Law Unions in Engladn and Wales, Leeds Union operated what were known as 'scattered homes'. 'Families' of a small number of children were placed in ordinary houses with a live-in foster mother. The Workhouse website carries a list of these scattered homes. The Central Home was on Street Lane and could house up to 40 boys and girls. It continued in use up until the 1950s. 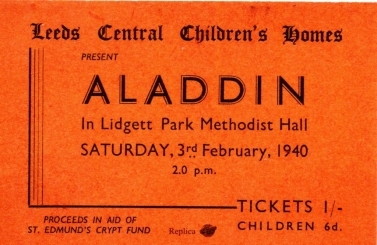 Another Leeds children's home was on Lingfield Approach on the Moortown Estate. It is pictured here. [external site] We'd love to hear from anyone who was there. Click here to email us. Try the West Yorkshire Archives in the first instance. [external site] . Also see our page on Accessing Records.